Is This Mid-Priced Grill Worth the Cost? Char-Broil Classic 4-Burner Gas Grill Model 463436215. Char-Broil LLC. If you were to design a grill, it just might have much of the same specifications as this Char-Broil Classic 480 gas grill model. Looking at the specifications sheet in the hardware store, this Char-Broil gas grill seems like the perfect buy. The heat output is perfect for the size and the shiny lid gives it the appearance of durability. The truth is, however, that this gas grill is more show than quality. The porcelain-coated cast iron cooking grates will give good sear marks, but the cooking box is flimsy and will rust quickly, heat unevenly, and fail to last long enough to justify even a discount price. 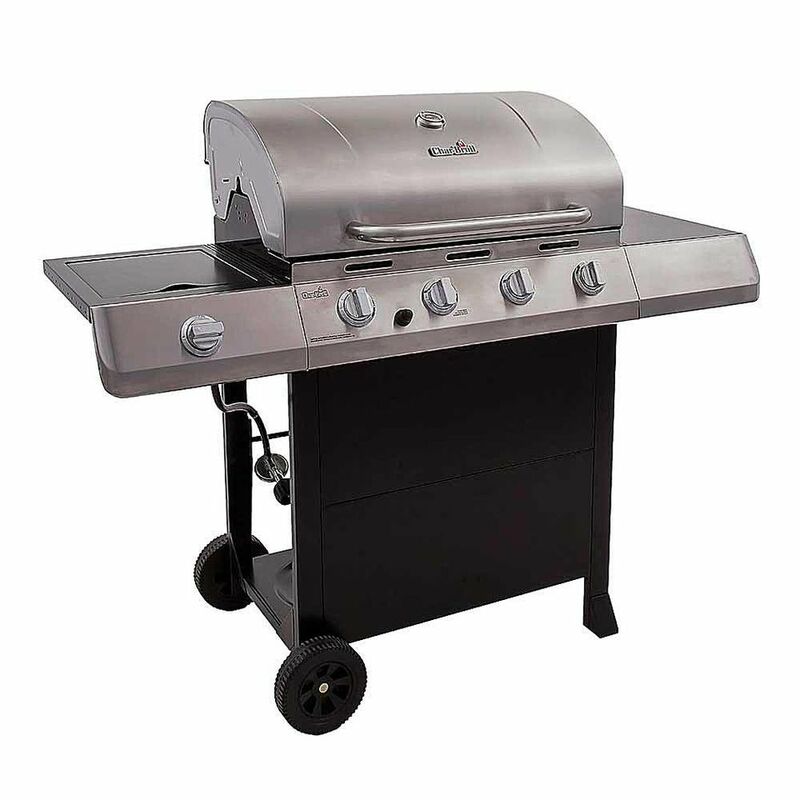 The Char-Broil Classic 480 gas grill has four stainless steel burners (each with 12,000 BTU) and plenty of cooking space for the whole family or large gathering, fitting roughly 24 hamburgers in the 480 square inches of cooking area. The cooking grates are coated in porcelain and the lid, handle, and control panel are made of stainless steel. There is a warming rack above the cooking grates, a side burner offering 10,000 BTU, and powder-coated metal side shelves offering additional workspace. The Char-Broil Classic 4-Burner's ignition button is electric, requiring a AA battery. Char-Broil claims that the porcelain-coated cooking grates are rust-resistant and easy to clean, but many users have reported that the grates rust easily and are prone to flaking. In addition, at this price, you may expect much better burners and barrier pieces than this grill provides. And all of these negatives result in uneven heating. Whether or not you tend to use the side burner on a regular basis, you want it to perform well. Unfortunately, the Char-Broil Classic 480's side burner doesn't have much power—it won't heat a small pot on a windy day. At this price, look for something smaller, much more basic, and without the stainless steel body parts. There are a variety of gas grills under $500 offering something better.